Atlanta Super Bowl LIII Host Committee Announces Partnership with The Icebox to Provide Uniforms to 10,000 Volunteers. The Atlanta Super Bowl LIII Host Committee (Host Committee) announced that it has partnered with The Icebox, the official uniform supplier for the Host Committee’s Team ATL volunteer program, to design and produce this year’s extensive collection of apparel, gear and accessories that will be gifted to its 10,000 hand-selected volunteers. The Icebox CEO and Co-Founder, Jordy Gamson noted that this type of high-profile partnership is an incredible opportunity for an Atlanta-made brand like The Icebox. The Host Committee has been working closely with the creative experts at The Icebox to cultivate a uniform look that encapsulates the celebration and elevation of Atlanta communities. To support the Host Committee’s Legacy 53 sustainability pillar, one of the pieces of the uniform collection will be made from recycled plastic water bottles, collected from Mercedes-Benz Stadium and Hartsfield-Jackson Atlanta International Airport and repurposed into fabric to create a unique and sustainable collector’s piece. The uniform was locally designed by The Icebox in-house design team, which spent weeks working to make the entire collection as functional, comfortable and as high-performing as possible. Every volunteer will receive six components as part of their uniform, which is purposefully designed for distinct identification and visibility to Atlanta guests. In addition to the core pieces, The Icebox designed complementary accessories to complete the overall look. 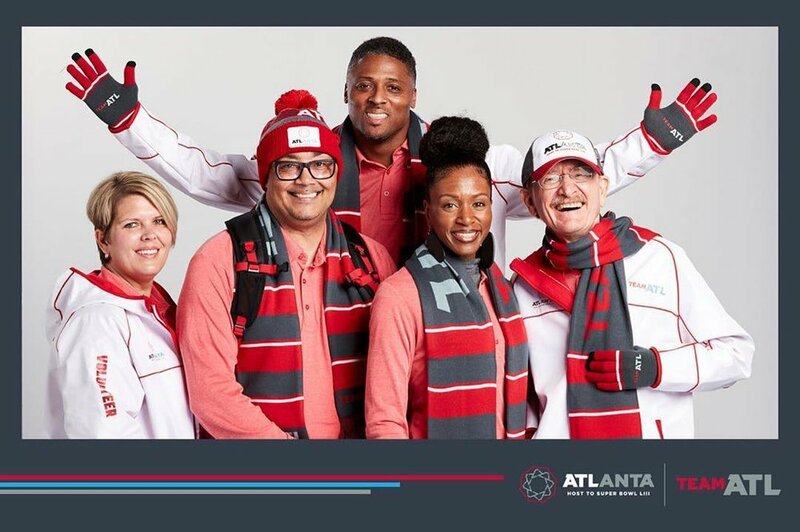 This December, more than 75,000 items will be kitted and handed out to Team ATL volunteers, who will be wearing these custom-designed pieces during key Super Bowl LIII official events, such as Super Bowl LIVE, the multi-day free concert event in Centennial Olympic Park. In addition to creating uniforms for the Host Committee’s 10,000 volunteers, The Icebox provided additional promotional items in support of the volunteer program and participated in the uniform reveal, which occurred on Sunday, October 28, at Mercedes-Benz Stadium. From concept to completion, watch the design process unfold in order to make 10,000 exclusive uniforms for The Atlanta Super Bowl LIII Host Committee. Volunteers have been issued custom-designed uniforms produced by The Icebox, a local company, to make the volunteers easily visible among the mass crowds. Lee Hendrickson, Director of Community Engagement and Volunteer Programs for the Atlanta Super Bowl Host Committee, stopped by along with Scott Alterman, Co-Founder of The Icebox, to show us the uniforms and talk about the excitement leading up to the big game. An Atlanta apparel and merchandise agency has been chosen to provide 10,000 Super Bowl volunteers with uniforms. The Super Bowl Host Committee named The Icebox the official uniform supplier for its Team ATL volunteer program. Icebox will design and produce a collection of apparel, gear and accessories intended to distinguish the workers from fans.